Prices shown are excluding VAT and are for plain garments. If you need custom LOGO embroidery email us today with your logo for quote on sales@embroidered-polo-shirts.com - we offer custom logo embroidered from us a little as £1+VAT for bulk order runs. 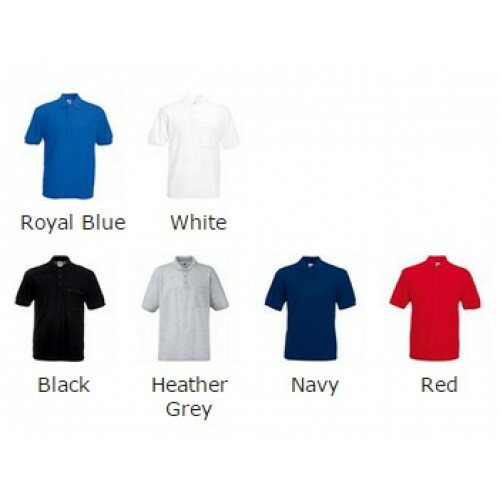 We at Embroidered-polo-shirts.com offer a huge choice in Fruit of the Loom brand. Its ideal for embroidery - this Fruit of the Loom make offer a large choice in colour/size to cater for the work wear, printable industry. 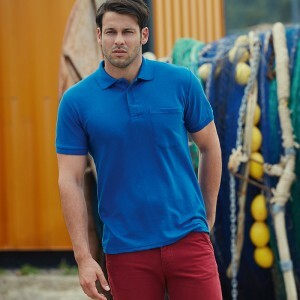 The Fruit of the Loom polo shirt is made from fabrication: 65% Polyester, 35% Cotton which is a quality weight of 180 GSM which is a good weight for Embroidery and printing. This 65/35 Pocket polo Fruit of the Loom make has features like Self-fabric breast pocket Performs at 60°C wash 3 button placket with self-coloured buttons sizes on offer are S, M, L, XL, 2XL, 3XL (35/37", 38/40", 41/43", 44/46", 47/49", 50"). This polo SS308 is on offer for quick delivery all over United Kingdom. For large orders in Fruit of the Loom brand then get in touch with us for trade prices in Fruit of the Loom manufactured clothing. Amount for 0 pieces garments. Available 9:30 am - 6:30 pm (FRI - SAT) want to speak to someone? We are here to answer questions. Just call!